Children living near highways are exposed to higher concentrations of traffic-related carcinogenic pollutants. Several studies reported an increased risk of childhood cancer associated with traffic exposure, but the published evidence is inconclusive. We investigated whether cancer risk is associated with proximity of residence to highways in a nation-wide cohort study including all children aged <16 years from Swiss national censuses in 1990 and 2000. Cancer incidence was investigated in time to event analyses (1990–2008) using Cox proportional hazards models and incidence density analyses (1985–2008) using Poisson regression. Adjustments were made for socio-economic factors, ionising background radiation and electromagnetic fields. In time to event analysis based on 532 cases the adjusted hazard ratio for leukaemia comparing children living <100 m from a highway with unexposed children (≥500 m) was 1.43 (95 % CI 0.79, 2.61). Results were similar in incidence density analysis including 1367 leukaemia cases (incidence rate ratio (IRR) 1.57; 95 % CI 1.09, 2.25). Associations were similar for acute lymphoblastic leukaemia (IRR 1.64; 95 % CI 1.10, 2.43) and stronger for leukaemia in children aged <5 years (IRR 1.92; 95 % CI 1.22, 3.04). Little evidence of association was found for other tumours. Our study suggests that young children living close to highways are at increased risk of developing leukaemia. The Swiss Paediatric Oncology Group and the Swiss National Cohort Study Group. Members of study groups in “Appendix”. The online version of this article (doi: 10.1007/s10654-015-0091-9) contains supplementary material, which is available to authorized users. The authors thank Dr. Christian Kreis for his assistance in calculating distance to highways and creating the map. This work was supported by the Swiss Federal Office of Public Health (Grants 08.001616, 10.002946, 12.008357), Swiss Cancer League (Grant 02224-03-2008), and Swiss Cancer Research (Grants 3049-08-2012, 3515-08-2014). BD Spycher was supported by a Swiss National Science Foundation fellowship (PZ00P3_147987). The work of the Swiss Childhood Cancer Registry is supported by the Swiss Paediatric Oncology Group (www.spog.ch), Schweizerische Konferenz der kantonalen Gesundheitsdirektorinnen und –direktoren (www.gdk-cds.ch), Swiss Cancer Research (www.krebsforschung.ch), Kinderkrebshilfe Schweiz (www.kinderkrebshilfe.ch), Ernst-Göhner Stiftung, Stiftung Domarena and National Institute of Cancer Epidemiology and Registration (www.nicer.ch). Approval of the study was granted through the general cancer registry permission of the Swiss Childhood Cancer Registry by the ethics committee of the canton of Bern. The members of the Swiss Paediatric Oncology Group Scientific Committee: R. A. Ammann (Bern), R. Angst (Aarau), M. Ansari (Geneva), M. Beck Popovic (Lausanne), E. Bergstraesser (Zurich), P. Brazzola (Bellinzona), J. Greiner (St. Gallen), M. Grotzer (Zurich), H. Hengartner (St. Gallen), T. Kuehne (Basel), K. Leibundgut (Bern), F. Niggli (Zurich), J. Rischewski (Lucerne), N. von der Weid (Basel). The members of the Swiss National Cohort Study Group: M. Egger (Bern), M. Bopp (Zurich), M. Puhan (Zurich), A. Spoerri (Bern), M. Zwahlen (Bern), N. Künzli (Basel), F. Paccaud (Lausanne), M. Oris (Geneva). HEI panel on the health effects of traffic-related air pollution. Traffic-related air pollution: a critical review of the literature on emissions, exposure, and health effects. Boston, MA (2010). Report no. : special report 17. http://pubs.healtheffects.org/view.php?id=334. Accessed 07 Aug 2015. IARC. Diesel and gasoline engine exhausts and some nitroarenes, vol. 105. Lyon, France: International Agency for Research on Cancer (IARC); 2012. http://monographs.iarc.fr/ENG/Monographs/PDFs/index.php. Accessed 07 Aug 2015. IARC. A review of human carcinogens. Part F: chemical agents and related occupations, vol. 100F. Lyon, France: International Agency for Research on Cancer (IARC); 2012. http://monographs.iarc.fr/ENG/Monographs/PDFs/index.php. Accessed 07 Aug 2015. Entec. Development of a methodology to assess population exposed to high levels of noise and air pollution close to major transport infrastructure. Final report for the European Commission. London, UK: Entec UK Limited 2006. http://ec.europa.eu/environment/air/transport/pdf/final_report_main.pdf. Accessed 07 Aug 2015. Schindler M, Mitter V, Rueegg CS et al. 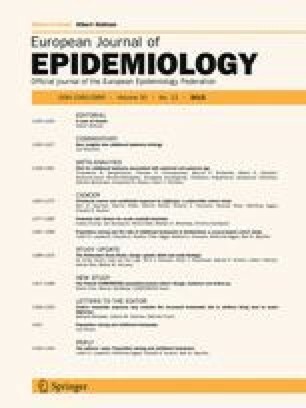 Death certificate notations in the Swiss Childhood Cancer Registry: Validation of registration procedures and completeness. In: Towards a harmonised cancer information system in Europe. Ispra, Italy: European Network of Cancer Registries (ENCR); 2014. http://www.encr.eu/images/docs/Conference_2014/ENCR_Book_of_Abstracts_2014.pdf. Accessed 07 Aug 2015. ARE. Nationales Güterverkehrsmodell des UVEK. Basismodell 2005: Modellbeschrieb und Validierung. Bern, Switzerland: Federal Office for Spatial Development (ARE) 2010. http://www.are.admin.ch/themen/verkehr/00258/00520/index.html?lang=en. Accessed 07 Aug 2015. FOEN. Pollutant emissions from road transport, 1990 to 2035. Updated in 2010. Bern, Switzerland: Federal Office for the Environment (FOEN) 2010. http://www.bafu.admin.ch/publikationen/publikation/01565/index.html?lang=en. Accessed 07 Aug 2015.